By Scott Gilfoid: Former WBO junior middleweight champion Liam Smith (26-2-1, 14 KOs) thinks there’s a good chance that his new promoters at Matchroom Boxing are going to match him up against former IBF welterweight champion Kell Brook (38-2, 26 KOs) soon after his next fight against Sam Eggington (23-5, 15 KOs) on March 30 at the March 30, at the Echo Arena in Liverpool, England. Smith, 30, signed a three-fight contract with Matchroom recently, and he sees himself being put in with the 32-year-old Brook, who now needs an opponent for his next fight after Amir Khan bailed on him by deciding to fight Terence Crawford on April 20. Matchroom promoter Eddie Hearn has limited options for Smith, who recently was beaten by World Boxing Organization junior middleweight champion Jaime Munguia (31-0, 26 KOs) on July 21 last year. Hearn can’t talk Golden Boy promotions, the promoters for Munguia, to let Liam have a second fight against him. That’s not going to work. Hearn wants Smith to be involved with big fights after he gets past the 25-year-old Eggington on March 30, but he needs a win over a notable contender like Brook for him to be taken seriously as a challenger for one of the champions at 154. It would look bad if Smith destroys domestic level fighter Eggington, and then he’s given a title shot against IBF/WBA junior middleweight champion Jarrett Hurd or WBC champion Tony Harrison. Getting another title shot so soon after losing to WBO champion Munguia is going to make it look like Smith is being given preferential treatment over the many contenders that have been waiting patiently for their shot at a title. 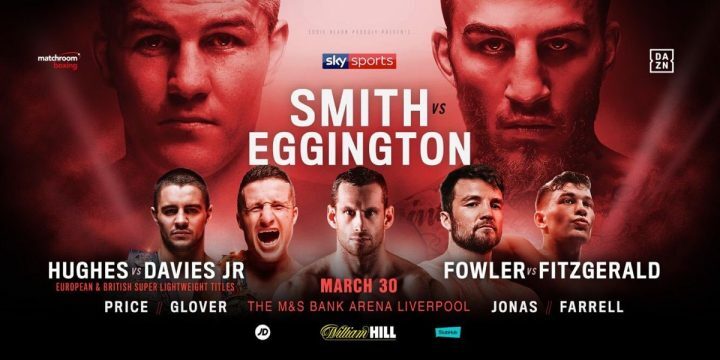 Smith will obviously be given a fight against Brook, but that sure as heck won’t be happening immediately after his fight against Eggington. It’s believed by boxing fan that Hearn is going to continue to protect Brook like a mother hen until he gets the fight with Khan. That’s the big payoff fight for Brook. Hearn has been matching Brook against mediocre opposition in the last year, making sure that he doesn’t lose before he faces Khan. If Hearn puts Brook in with a contender like Smith in 2019, that could ruin his plans for the Khan-Brook fight. In other words, both Brook and Khan could wind up losing their next fights, which would make their grudge match more of an affair between over-the-hill fighters rather than a match between two top contenders in their respective weight classes. Brook has a say so in who he’s matched up with by Hearn. It’s unlikely that Brook will agree to fighting Liam Smith. The two of them sparred with each other in the past, and Brook looked like he got the worst of it. In one small clip, Smith is shown nailing Brook with a tremendous right hand to the head that had him backing off in a hasty retreat. Given Brook’s problems with eyes, he might come apart piece by piece against Smith, and end up having to take a knee or have his trainer throw in the towel to save him. With Brook and Khan losing, Hearn would be crying crocodile teams, knowing that the British boxing public won’t be nearly as keen in purchasing the Khan-Brook fight under those conditions. “First and foremost, I want to do a good job on Sam Eggington, and then we’ll see what the second fight [of my three-fight contract with Matchroom Boxing] is. As long as I’m looking to win a world title in a massive fight, it’s great,” Smith said. Eggington is not a threat to beating Smith. This is just a stay busy fight for Smith. Eggington has lost twice in the last two years in losing to Hassan Mwakinyo by a shocking 2nd round knockout last September, and getting beaten by Mohamed Mimoune	by a 12 round split decision in October 2017. Eggington was also beaten by Bradley Skeete by a 12 round unanimous decision in 2016. Brook (38-2, 26 KOs) is coming off of a 12 round unanimous decision over Michael Zerafa on December 8. Brook looked terrible in beating the 26-year-old Zerafa in a fight that was a lot closer than the wide scores the judges handed in. That fight showed that Brook can’t be counted on to beat the top fighters in the 154 lb division. The way Brook fought, Liam Smith would have a field day against him if Hearn dared to make a fight between them. Hearn obviously won’t make the Brook-Smith fight until after the Khan vs. Brook fight is done with. Once the smoke clears from the Khan-Brook fight later this year, Smith will get his chance to fight Brook. That’s the only way Smith will get a chance at fighting Brook in this writer’s view. “I’ve sparred with him,” Smith said about Brook. “I know he’s a very good, talented fighter. I feel like I’d be confident against him. He’s a tough fight. We’ve had these spars,” Smith said. Smith looks like he’s fighting at a higher level than Brook right now. If that fight gets made, Smith will likely chop Brook apart, and do a better job of doing it than Errol Spence Jr. and Gennady Golovkin both did. It’s not that Smith is a better fighter than those guys. Brook has mileage on him now, and he’s had a lot of time out of the ring with his eye injuries. Moreover, it’s now been close to two years since Brook last fought a quality opponent in his loss to Spence in May 2017. Brook’s last two fights have been mismatches against Zerafa and Sergey Rabchenko. Brook burned up all of 2018 with those mismatches, and Hearn is likely going to match him next against Jessie Vargas, a fading welterweight, whose career is on the slide as well. “Definitely,” Smith said when asked if he felt that he was in the position to beat WBO junior middleweight champion Jaime Munguia in their fight on July 21 last year. “In the Canelo [Alvarez] fight, we knew he was heads and shoulders above me. We knew he was a talented fighter. I went there to win. I felt like I could beat Jaime Munguia, definitely. I felt like during the fight that I was going to beat him. I tired out a little bit, and then he kept going. His punch variety stayed the same. Mine dropped. I feel you’ll see the best of me this year. I feel like I just turned pro,” Smith said. Smith landed some nice shots in the Munguia fight, but in the last half of the contest, he fell apart from the pressure from the Mexican talent. Munguia turned up the heat on Smith, and had him worn out with body shots. It was lucky for Smith that he wasn’t knocked out, because he was fighting like an old car with over 300,000 miles on him in the championship rounds. Munguia was having his way against the tired looking Smith. You’ve got to give Smith credit for staying in there for the full 12 rounds, because he could have been pulled out in the last four rounds, but he clearly didn’t have the engine to keep up with Munguia.